MRI and CT scans have several differences, though your doctor uses both for imaging. Find out why your doctor may recommend one over the other and how they differ. What sets these scans apart is critical in choosing the right one for diagnosis. Discover the differences and how you can prepare yourself for your next scan, whether you need an MRI or a CT. Breast cancer: Doctors can find breast tumors with an MRI. Tumors: Other cancerous masses around the body appear on an MRI, allowing for examination of suspicious areas. Joint abnormalities: Ligament, joint and tendon problems appear clearly on an MRI. Blood vessel irregularities: Several types of blood vessel issues can appear on an MRI. These issues include aneurysms, damage from previous heart attacks, artery blockages and other problems with the heart or blood vessels. Brain problems: An MRI is often used to diagnose multiple sclerosis, stroke, aneurysms and other conditions that originate or affect the brain or spinal cord. Inflammatory bowel conditions: With an MRI scan, doctors can examine bowel conditions marked by inflammation such as ulcerative colitis and Crohn’s disease. Liver disease: Damage to the liver from disease or lifestyle, such as cirrhosis, appears on MRIs. Bone disorders: MRIs will show both bones and the soft tissues around them. Seeing both gives your doctor a complete image of your bone health and if you have infections or tumors on or near your bones. Before the scan, you may need a contrast agent. Sometimes, you will have one scan without the contrast dye followed by an MRI with the dye. Depending on what parts you are having scanned, you may drink the solution or have it injected into a vein. After removing all clothing and jewelry, you’ll dress in medical scrubs (top and pants) or a hospital gown. Next, you’ll lie on the scanner table, which slides into the device. You will have earplugs or headphones to wear. The machine makes a lot of noise while running. During the scanning process, you may be required to hold your breath for specific scans. Even the slight movement of breathing can affect the results. MRIs are painless and last up to an hour, though some may take slightly more time. CT stands for computed tomography. Sometimes, these are referred to as CAT scans, which stands for computerized axial tomography. CT scans use x-rays to create multiple cross-sections of your body. These scans are extremely popular, with 70 million performed annually in the United States. Circulation problems: Heart disease, blood vessel blockages, kidney problems, pulmonary edemas and aortic aneurysms are viewed and diagnosed with CT scans. Abdominal abnormalities: Unknown masses in the liver, pancreas or kidneys can be identified as tumors or not. Urinary bleeding causes: Why you have blood in your urine is another symptom CT scans can investigate. Lung issues: Breathing problems can be diagnosed through one of these scans that can identify signs of fibrosis, emphysema, tumors, pleural effusion, collapsed lungs and more. Skeletal system problems: Sometimes, regular x-rays don’t give doctors enough of a picture of the bones. CT scans are better for seeing complex fractures, spinal cord injuries, osteoporosis damage and bone tumors. Head conditions: Hemorrhaging, brain calcification, tumors and blood flow problems to the brain can be seen on a CT scan. For the computed tomography scan, if your doctor requested a contrast, you will have the fluid injected into your system. If you need a scan of your digestive tract, you might be asked to drink contrast. After putting on medical scrubs (top and pants) or a hospital gown, you will lie down on a table, very similar to the one used for an MRI. The table slides into the scanning device, which is much quieter and faster than an MRI. You should not feel any pain during the exam. Nothing touches your body during the scan. Most scans finish in 10 minutes. How Do MRI and CT Scans Differ? 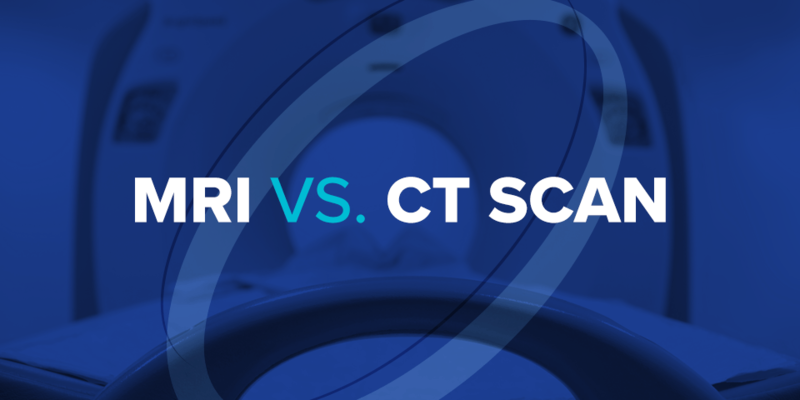 There are several differences between CT scans and MRIs. Usually, your doctor will decide on the best scanning tool for your situation. Here are several ways the two stand apart. Cost: CT scans are almost half the price of MRIs. The average computed tomography scan costs around $1,200 while an MRI is about $2,000. Speed: CT scans take much less time than MRIs. The exact time required depends on whether you need a contrast dye for the procedure, but MRIs always require more time for the scan. 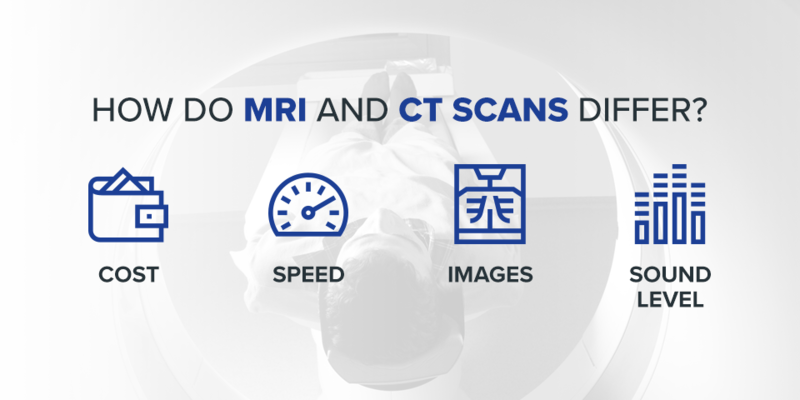 A typical CT scan lasts 10 minutes whereas MRIs can take up to an hour or longer. Images: MRIs will produce sharper, more detailed results, especially of soft tissues and behind bones, which may block views on CT scans. Sound level: MRIs tend to be very noisy, and you will get earplugs or headphones to reduce the effect on your ears. CT scans are much quieter than MRIs, and you won’t need ear protection during the procedure. Magnetic resonance imaging produces clearer images compared to a CT scan. In instances when doctors need a view of soft tissues, an MRI is a better option than x-rays or CTs. MRIs can create better pictures of organs and soft tissues, such as torn ligaments and herniated discs, compared to CT images. MRIs cost almost twice the cost of CT exams. When price is an issue, talk to your doctor to see if you can have an alternative, cheaper imaging done. Also, phone or email your insurance company to verify that it covers the procedure. Don’t forget to ask how much your insurance will pay for the MRI scan. An MRI requires more time, and depending on your level of noise tolerance, could be too loud. Some patients experience anxiety or claustrophobia in an MRI due to the closed tube design and noisy operation. Because MRIs rely on precision for creating sharp results, any movement can produce blurred results. You must carefully control your breathing as directed during the procedure. If you need images of a part of the body not in your thoracic region, you may be freer with your breath, but you will need to remain completely still for the scan. Another limitation of MRIs appears when using these devices to diagnose cancer. Sometimes, cancer tissue and excessive fluids look the same in an MRI. You may require other tests such as biopsies to confirm the presence of cancerous tissue in your body before you can start treatment. Compared to MRI scans, CT scans have several advantages. For larger individuals who may not fit comfortably inside traditional MRI devices, CT scans may be a better choice due to their more open design. Because this procedure produces results so much faster than an MRI, it is doctors’ preferred choice for a scanner for making a diagnosis in an emergency. When time is of the essence in determining the cause of stroke to start treatment, a CT scan cannot be matched. Doctors can identify if the stroke occurred from hemorrhaging or by a blocked artery. While CT has advantages, it is not perfect. The amount of radiation you experience from a computed tomography scan can be up to 1,000 times more than you get from an x-ray. Even at these levels, the radiation is a small dose, but if you require multiple scans over your lifetime, it can add up. Despite costing less, CT images don’t capture as many details as MRIs, and the doctor may miss some crucial pieces of information. While CT machines can accommodate larger patients, there is still a limit. Traditional scanners can allow for patients up to 450 pounds, depending on the model. The patient’s back to front measurement across the widest point should also measure less than 28 inches. The right scan for you will depend on what your doctor is looking for. 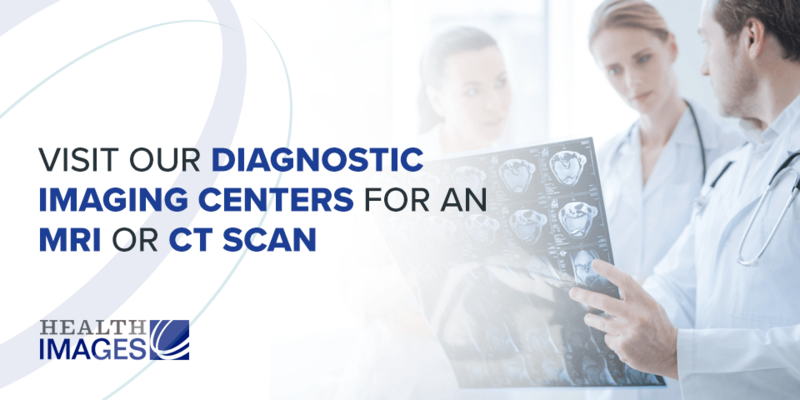 Your symptoms and health history will guide your physician to make the best decision when choosing a diagnostic scan. The risk factors you have that may prevent you from having a CT scan or an MRI will also become vital criteria when your doctor selects the right scan for you. These devices often contain iron-based metal and may be pulled from the body by the magnetics in the MRI. Pacemakers can malfunction. Aneurysm clips may dislodge, leading to fatal bleeding. Some dark tattoo ink is metallic, which could interact with the MRI’s magnet. 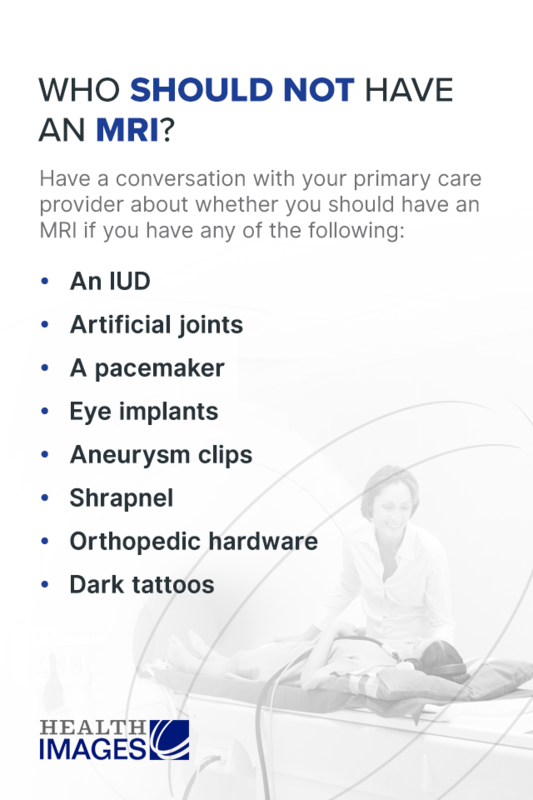 If you have any implants constructed from titanium, you can have an MRI. Ask your doctor which scan is right for you if you have heart or kidney problems and need contrast dye. The dye used, a gadolinium-based product, is well-tolerated by those allergic to iodine and shellfish. Those with severe claustrophobia can still get an MRI. Ask if an open MRI is a good option for you or see if you can use a sedative to remain still during the scan. Being claustrophobic is not a reason to pass on a needed MRI. Pregnant women have been able to have MRIs since the 1980s with no reports of harm to mothers or unborn children since then. Doctors, though, don’t know about how the magnets affect fetuses under four months of development. If you are pregnant, especially if you need a contrast agent for the scan, ask your doctor if the procedure can be put off until after the baby arrives. Unless an absolute necessity requires you to get an MRI with contrast while pregnant, try to avoid it. Who Should Not Have a CT Scan? Not everyone should have a CT scan. While the scans are relatively benign, they do expose you to radiation. The chances of developing cancer from one CT scan are around one in 2,000, but radiation exposure builds over your life. Because too much exposure to radiation in childhood could lead to cancer as an adult, doctors tend to not recommend CT scans for children or those who require multiple scans. You should discuss with your doctor if you’re allergic to iodine contrast dyes, which are often used for CT scans. If you are, you may be a better candidate for an MRI. Iodine can cause severe allergic reactions in those with sensitivities to this substance. Pregnant women who need abdominal imaging may risk exposing their unborn child to radiation during a CT scan. If you are pregnant, voice your concerns about the risks of radiation from a CT scan with your physician. Inquire as to whether another imaging option will suffice. The facility you select for your MRI or CT scan makes a difference in your experience. Visit a diagnostic imaging center that works with you to give you the best experience possible. If your doctor requested an MRI, we have open MRI scanners, open bore and short bore machines to make the scan more comfortable and less confining. Our centers also have top-notch MRI equipment that is the best technology available for this type of scanning. Like our MRI scanners, we have top-of-the-line CT scanners to create 3D images of your body. We make the most of your time, and most scans take under an hour to complete. We’ll schedule the scan at a time that is convenient for you, and you don’t have to worry about calling your insurance company to check for coverage. Our offices coordinate with your insurance company to see how much your plan covers the scan. When your doctor needs quick results from your scan, rely on our imaging centers, which have the fastest time for results to be returned in the industry. Thanks to the speed and clarity of our imaging equipment, we help your doctor to quickly and accurately diagnose your condition. We serve several major metropolitan regions, including Denver, Boulder, Castle Rock and Longmont. You will likely find a location near you. Contact your nearest Health Images imaging center to make an appointment for your MRI or CT scan. We’ll give your time and health our highest respect, as we do for all our patients. See us for any imaging you need, from MRIs and CT scans to mammograms.